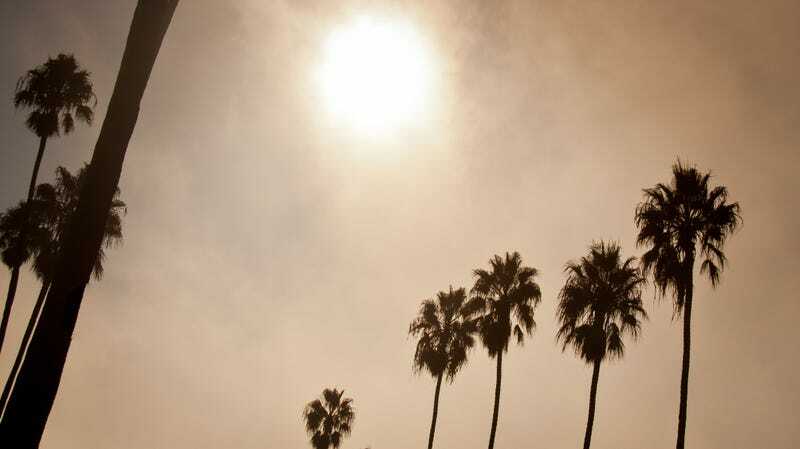 June Gloom season is upon Southern California. For as long as anyone can remember, that’s meant clouds wrapping the landscape in a milky white cocoon as cool, moist ocean air known as the marine layer moves inland. But as with everything in our world, this is now changing. June—and summer as a whole, it turns out—is becoming less cloudy in parts of Southern California. Great for your garden perhaps, but new research shows the trend is also increasing the risk of wildfires, which are on everyone’s mind after last year’s record-setting Thomas Fire. The findings could add a key variable for firefighters and meteorologists to look at to gauge how bad fire conditions will get in a given year. The research, published this week in Geophysical Research Letters, uses a novel approach of looking at sky observations taken continuously at airports and military airfields from San Diego to Santa Barbara since the 1970s, and linking them up with weather observations. Specifically, the researchers were looking for the occurrence of stratus clouds, which tend to hang out lower as part of the marine layer and keep things cool. The data shows that stratus cloud cover from May-September has declined 25-50 percent across a number of sites in Southern California owing to the growing urban heat island and climate change. All this extra heat causes the clouds to dissipate or form in areas with less of a cooling impact. “Those clouds that do remain are developing higher in the sky and are therefor thinner and are letting in more sunlight than the lower clouds 40 years ago,” Park Williams, a climate scientist at Lamont-Doherty Earth Observatory and lead author of the study, told Earther. The dip in cloud cover was particularly strong near Burbank, Santa Ana, and Santa Monica to the point that a cloudy summer today is more like a mostly clear one in the early 1970s. Scientists measure how much energy is reaching the surface in a metric known as watts per meter squared. Williams said they found in the past 43 years, the increase in watts per meters squared in some locations is more than double what’s expected over the course of the entire 21st century due to rising carbon pollution. All that extra sunlight coming in is causing more evaporation. Figuring out how much the ground and vegetation are drying out is the key to understanding the relationship between cloud loss and fire conditions. As luck would have it, a weather station has been taking measurements related to those elements right next to the Santa Barbara airport every 15 minutes for the past decade. All told, that station gave Williams and his crew access to about 82,000 weather and energy observations to link with the airport cloud observations. They then fed all that into a model to figure out how the shifts in sky cover seen at airfields across southern California were affecting the ground. “The methods and other results seem to be reasonable and of interest,” Aiguo Dai, an atmospheric scientist at the University of Albany who has also used airport observations for research, told Earther. He also said he would’ve liked to see more discussion about how changes in observational methods over time were accounted for. Williams said they found the increased evaporation from additional sunlight is equivalent to losing an extra inch of water a year to the atmosphere. In years with less precipitation, that means vegetation can dry out and become more prone to catching fire. The results bear that out, showing that in years fewer clouds are tightly tied to larger areas burning. Yet despite that strong relationship, burned area hasn’t increased in Southern California as a whole. That may be for a couple reasons for that, the first one being observational bias. Airports are often located in pretty developed areas more likely to kill clouds. Outlying areas may not be losing their cloud cover as fast. Increased urbanization could also be reducing fuel for fires and making fire-prone habitat more fragmented. And because the region has also seen an overall decline in precipitation, there might not be as much vegetation to burn (it’s not a coincidence the Thomas Fire—the largest fire in state history—occurred after one of the wettest years on record). All of this is to say it’s complicated, but it doesn’t mean the results aren’t useful. Williams suggested this newly-quantified relationship could help forecasters assess wildfire risk by including airport observations of cloud cover in forecasts. The results are also broadly applicable in other Mediterranean climates where marine layer clouds form like coastal Chile, western Australia, Spain, and Portugal (which just had a relentless fire year). Better forecasts can mean better allocation of resources and knowledge for firefighters about the conditions they might face. It could even help save lives.